A free Saturday afternoon at Maryville College calls for a spontaneous trip to the Great Smoky Mountains National Park. We went to the park to search for salamanders and the GSMNP has the highest population of these amphibians in the world. 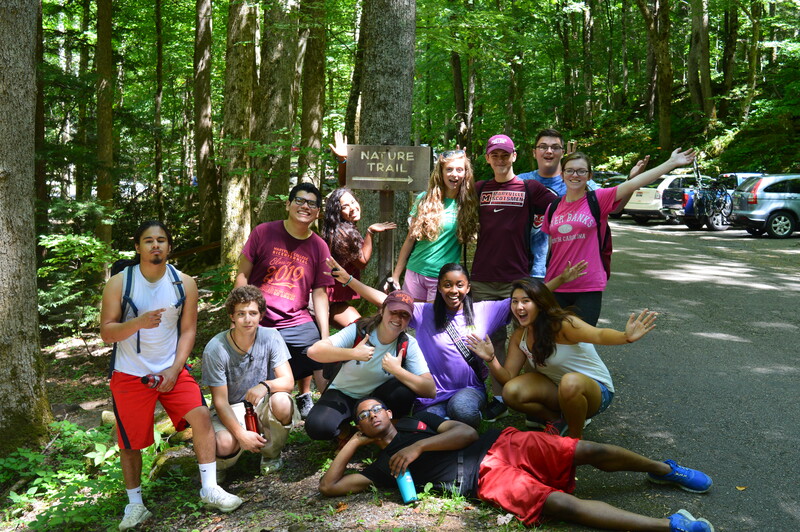 According to our peer mentor, Thomas Moore, the trip from MC to the park would only be a forty-minute drive. An hour and ten minutes later, we finally made it to our destination. We now call his ETA “Thomas Time.” Jokingly and all in good fun, we know we wouldn’t have been there without him. Once we parked, we met up with everyone else at the Chimney Tops picnic area, we started hiking up the Cove Hardwood Nature Trail. After we found the first place that looked like a place where salamanders would like to live we started searching. Within thirty seconds, Tyler Lee found the first one of the day and then I found the second one. 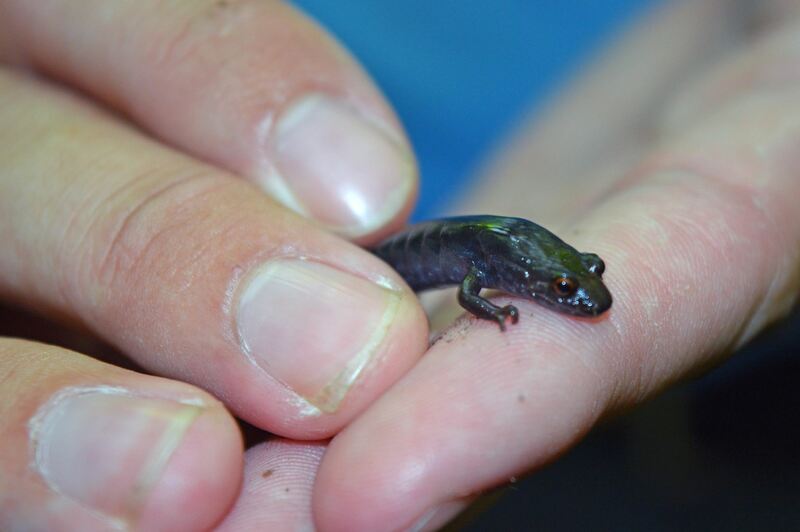 Every time someone found a salamander, we would carefully carry it over to Thomas for him to identify. While on this trail we found five different species of salamanders (Black-Belly, Seal, Dusky, Imitator, and Jordan or Red-Cheeked Salamanders). About mid-hike on the trail, our group came across a fallen tree with a hole underneath it. Of course, me being me I went over there searching for a salamander, but I ended up getting more than I bargained for. Before I knew it, I had gotten stung three times by yellow-jackets. It was in the name of science, of course, so it was worth it. After finishing the Nature trail, we drove about 4 miles to Alum Cave Trailhead to find more salamanders. This time, we adventured over to Walker Camp Prong which flows West of the Little Pigeon River. The water was ice cold, but refreshing considering the temperature was reaching over 90 degrees Fahrenheit. Many of us found salamanders in the rocky creek bed, but considering the terrain, the salamanders had the home field advantage. Unfortunately, we were unable to capture the powerful swimmers with our hands, but we were able to identify three species that we saw (Black-Belly, Seal, and Dusky Salamanders). Dusky Salamanders are the most common and diverse in color, their camouflage proving useful for hiding against and under rocks. After spending about an hour at Walker Camp Prong, we decided to pack up and go back to Maryville College. I enjoyed this experience very much because I’ve never done anything like this before, and I got to spend valuable time with my new and hopefully lifelong friends. 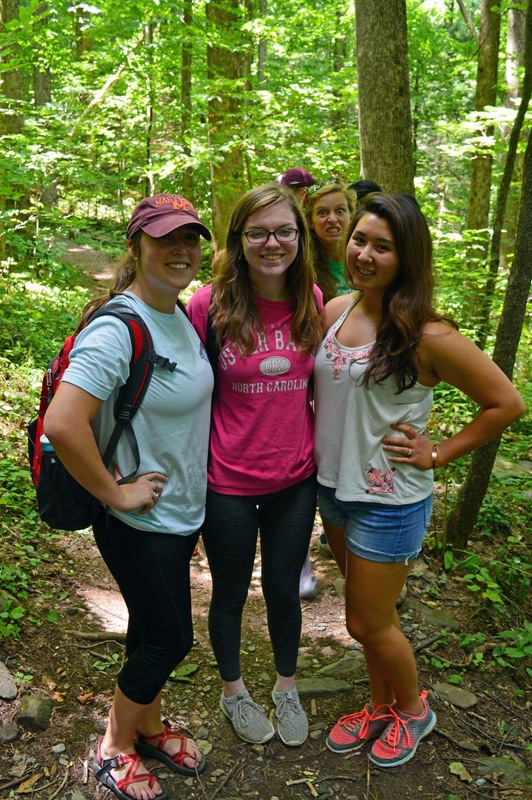 I value this fun and educational experience to the Great Smoky Mountains National Park where we had the privilege of coming into contact with some of God’s greatest creations.